Red roses are to Valentine's Day what kisses are to love; they make the occasion that much sweeter. 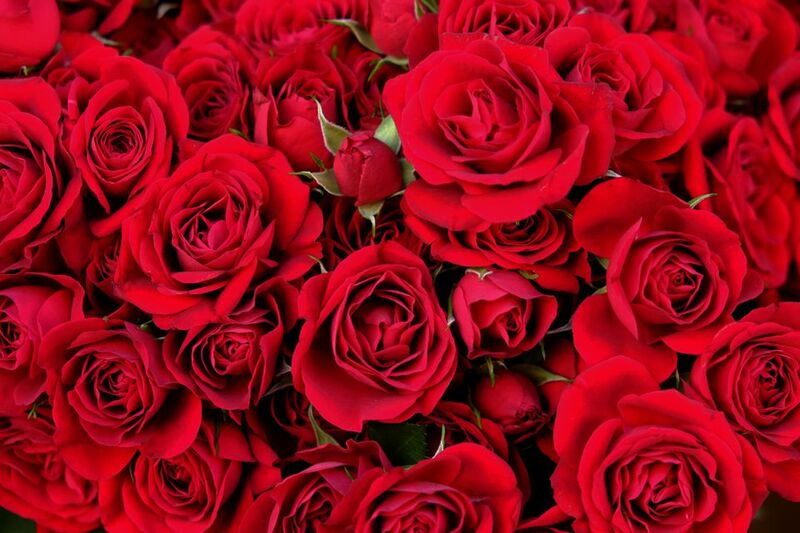 Thanks to their abundant beauty, red roses have long been a Valentine's Day symbol. And nothing says romance more than a bouquet, whether delivered personally by hand or sent to someone's office where they can be put on display, admired and envied by co-workers. If you decide to send a floral gift to a place of business, consider adding a vase to your order so that the recipient won't be stuck finding a vessel to display the roses. Note: Red roses are magnificent to look at but are not particularly fragrant, So if you want to appeal to your lover's senses or both sight and smell, consider adding another type of flower, such as lilies, to a bouquet. Whether you can afford to buy single red roses, a small bouquet of red roses combined with other flowers, long-stemmed red roses, or an entire room filled with red roses, the gifts below can convey the depth of your feelings. The classic Valentine's Day bouquet features twelve beautiful red roses. An inexpensive vase may be included. Buyers have the option of upgrading to add more red roses to fill out the bouquet and make it even more impressive looking. In red roses, as in life, sometimes bigger is better. This selection of long-stemmed red roses features big-headed and elegantly long red roses that open beautifully, each petal a work of art. Add a vase for an additional fee or have them delivered in a protective package. When a dozen red roses feel like a little less than you want to send and three dozen red roses may stress your budget or seem excessive, choose two dozen red roses to delight your love. Selecting these with long stems adds an additional touch of elegance to your order. Wow! Want to make a powerful impression on Valentine's Day or any other time of year with a surfeit of red roses? Tell her you love her 100 times with this tall bouquet that yields more than 100 red roses. It's a great way to decorate a room as a prelude to a proposal. If there's a more elegant floral combination than red roses and calla lilies, I haven't seen it. Perfect for the holidays... and to melt a heart, this bouquet combines red roses with pure white lilies, which are nothing short of stunning and fill a room with fragrance. Does she have a green thumb? In that case, she may appreciate this small rose plant even more than cut flowers. The red roses arrive in bloom and can be replanted outside in warm weather. Click through to see this year's pot design. Does she love red velvet cake? She may find red velvet roses just as yummy. Red velvet roses have a distinctive look, with white petals tipped with red. When the buds fully open, the bouquet is transformed into a cache of beautiful red roses, no white in sight. Depending on the recipient, a long-stemmed beauty may be perceived as incredibly romantic, wisely frugal or insultingly cheap. Know your audience! Where Can You Find a Honeymoon Suite?